WASHINGTON, DC (Herald de Paris) — One of the benefits living in DC is the easy distance to New York for a rejuvenating getaway; an opportunity of switching gears from a conservative but beautiful city to an edgy, throbbing, invigorating environment that always leaves one wanting more. Yes, I love New York and when my business dictates meetings in New York, I make sure to go to get my energy fix. One just moves twice as fast in New York and gets twice as much done. One’s brain works in hyper drive and ideas and possibilities just keeping coming. Of course, with that comes, the need to make sure you have quiet time, and soothing space to heal one’s body. In other words, where you live or stay is equally important as where you go, if you are going to fully enjoy the experience. Hotels in New York used to be exorbitant for years. Then Airbnb took hold 3-4 years ago, and hotels found themselves being left out of the equation. And who could blame the guests? At trumped up charges of over 800USD per night for a somewhat average hotel, it was a far better option to stay in a local’s elegant townhouse or modern apartment in Manhattan for USD100-USD200 per night. However, things changed again. By 2015 it was swings and roundabouts. Certain, but my no means all, Airbnb hosts started to take advantage and run cheap imitation hotels, with two to three beds in a room exploiting both guests and building owners. The city clamped down and these unseemly hosts were got rid of. In their place a new range of commercial professional luxury boutique hotels moved in, completing their refurbishments and taking advantage of a mass populous coming into Manhattan that knew luxury, were experienced travelers and more than willing to pay USD100-250 per night, if it was for somewhere decent and higher end. Now, these new hotels compete directly with the remaining airbnb hosts. These new boutique luxury hotels on average, are the same price as many airbnb hosts, and with that, as a traveler, the better and more convenient bet is on the hotel..if it is good, in a great location and is all it sets out to be. One such hotel is the new Renwick Hotel. It ticks all the boxes- a decent four plus star, clean .innovative, well located and design that is as interesting as many of 5 and 6 star luxury boutique hotels around. We stayed in a king suite and were blessed with high ceilings that gave the room an added sense of space. We were not disappointed in the room and it was a pleasurable space to spend time in. Admittedly as a suite it is larger than some of the other rooms, however that being said, all the rooms are comfortable. I have heard just make sure you get a room away from the elevator. The design was odd, sure, but as a whole , it worked and it worked for the environment that is New York. 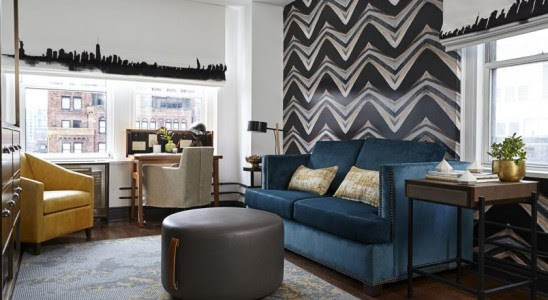 The boutique Renwick Hotel was formerly a “writerly” retreat and this luxury lifestyle hotel combines the vibrancy of Downtown with the creative artistry of Midtown East. It is situated right near Grand Central Station, the New York Public Library, and Bryant Park. The Renwick does have a comfortable and unique restaurant but we were there in the first week of the restaurant opening. It was suffering from serious teething problems both in management and a limited fine dining menu,with extremely small portions. This is one restaurant where the Chef /Owner needs to be very hands on, hold it with a tight rein, and not leave in it’s first months. The Chef /Owner were not there when we were present. The Renwick Hotel itself, has a crisp, clean design, and 173 loft-style guestrooms and suites. The beds are comfortable and just what you need for a good night’s rest. We loved our King suite and far preferred the room over other hotels in the area. The hotel’s amenities are upscale,and the hotel staff could do with some more training to become more knowledgeable in some areas, such as local restaurants and trendy hot spots, but that being said, they are are friendly,polite eager to help and please and take pride in their work. There are many way to get to New York for DC. We took the train one weekend. But at USD176, each way, per person it is a pricey option. DC to New York we took the Tripper Bus which offer a basic service, leaving from Arlington and DC. The staff were very nice and the pick up locations very convenient. It was very bumpy getting out of DC due to all the construction and we did think the driver could have made it a bit easier on passengers. I think the driver was trying to make up for lost time due to heavy traffic that day in DC. We did arrive on time at Pennsylvania Station (Madison Square Garden) in New York. Once we were on the highway it was a smooth journey, with one brief stop, which was good to stretch your legs, and if you are budget conscious definitely a good bus to take. We preferred the luxury bus that we took for our return trip. The Vamoose Gold Bus. Make sure you get the Gold Vamoose as there is a regular Vamoose as well. For us it was worth paying the extra for the more spacious and comfortable seating of the Gold Vamoose Bus. Both Tripper and Vamoose offer reliable services.